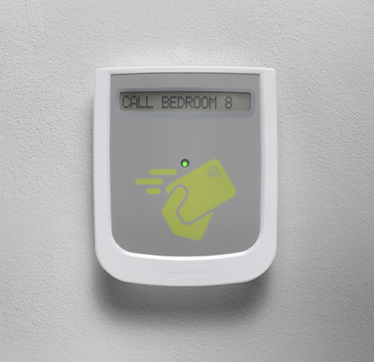 The Access Point is a simple, cost effective, wireless ID security system. Using Radio Frequency Identification technology (RFID), the Access Control Point allows hospitals and care facilities to control access to sensitive and restricted areas. The Access Control Point controls the door locking mechanism at a variety of entry points and raises an alarm on the call system should there be unauthorised access. Vulnerable patients and their family can rest assured knowing they are safe from unauthorised visitors 24 hours a day, 7 days a week. ID cards can be programmed using individual staff identity information. Cards can be printed with your facility’s logo and brand colour palette, making them instantly recognisable as belonging to your facility. With multiple programmable access levels, entry to sensitive areas can be managed, staff movement monitored and recorded on our data log database system - allowing for full accountability. The Access Control Point is installed on the simple Intercall Bus network and individually programmable via the Intercall Device Programming Software.